The tough concrete shell of Vilanova Artigas’ architecture school in Sao Paulo (above) conceals a central atrium that embodies an ethic of collaboration (below). One recent afternoon, a City College student named Murraja led me to the top of Rafael Viñoly’s new Bernard and Anne Spitzer School of Architecture, showing off the amphitheater on the roof—the crown atop Viñoly’s radical redesign of an undistinguished 1950s library. Like the building’s interior—with its central atrium allowing pin-ups to be communal events—the rooftop expressed an emphasis on public space and sharing work in a larger context. Even in a driving rain, the saffron-yellow theater, with seats looking south toward the Manhattan skyline, had an exhilarating impact. As Murraja waited for me to run my circuit around the theater, I couldn’t help but think of the generation of Latin American architects who made bold moves under a big sky—Oscar Niemeyer, of course, but also Luis Barragán and, especially, João Vilanova Artigas. Though Vilanova Artigas (1915–1985) had been a follower of Frank Lloyd Wright early in his career, he eventually embraced the Brutalist aesthetic of the so-called Brazilian Style epitomized by Niemeyer and Lucio Costa. For Artigas, architecture was a way to expose social disparity, not a forum for what he saw as pat responses to social problems. He treated homes as he treated schools and bus stations: open spaces defined by vast roofs and ramps for circulation, where the stress was put on communal living, not privacy. 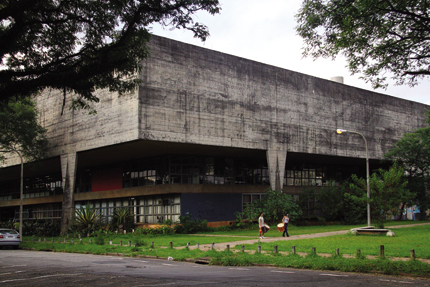 Last spring I went to see Vilanova Artigas’ Faculdade de Arquitetura e Urbanismo in São Paulo, built in 1968. I’d read about the FAU, as it’s called, and seen heroic photos of the building standing on its site like an arms-akimbo Superman, solitary and tough. But in real life, it was hidden by trees and vines that seemed ready to climb through rows of louvered windows behind its rough-hewn concrete shell. Like Viñoly’s school at City College, its centerpiece is an atrium, a massive space with a grand ramp leading up through the building. No matter where I stood, I could pivot and see everything: students studying, pinning up work for a review, even taking a dance class. (As in Viñoly’s school, where uncomfortably low ceilings plague parts of the studios, here the individual classrooms, all on the building’s periphery, were cramped and dark—a disdainful concession to the traditional school setup.) Sunlight filtered through skylights—now in dire need of repair—and angled in through the ground-floor entry, which is open to the outdoors. Despite its tough concrete, the FAU exuded a sense of lightness, a thrilling contradiction between material and effect. A communist like many of his colleagues, Artigas saw design as a form of evangelism. The educated class that would lead the coming revolution would cut its ties to consumerism, so his architecture was going to teach them a lesson in austerity. 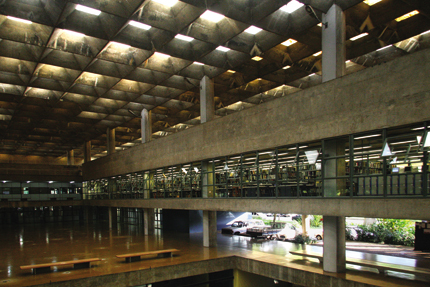 His protégés, founders of the Arquitetura Nova movement, would address Brazil’s class disparity in a very different way—conceiving well-made, inexpensive houses—but their education was informed by the FAU’s intoxicating atrium, where Artigas demonstrates his belief in the power of collaboration. Artigas was uniquely qualified to design the FAU. As the leading member of its faculty, he had created the school’s curriculum, a Bauhaus-style program that placed technical skills, history, and design on equal footing. The FAU was meant to embody that unity, and it does. Like the plaza underneath Lina Bo Bardi’s Museu de Arte de São Paulo, the FAU atrium was designed not only to provoke conversation among disciplines but to host large-scale political and cultural events. There is an archival photograph of the space filled with thousands of students—a shot that would have symbolized much to the military government in power at the time of the school’s inception. Will CCNY’s new building foster the kind of analysis of design and class provoked by the FAU? Certainly the circumstances are different, but in a public school with a student body far more diverse than most, Viñoly’s spur to interaction is an exciting start.